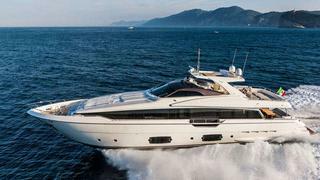 Mike Newton-Woof at Ventura Yachts tells me he's closed on the sale of a new 29.2m Ferretti motor yacht with Richard Inwards of Inwards Marine bringing the buyer. The Ferretti 960 is the largest yacht from this Italian yard and, currently under construction, is hull No 6 in the flagship series. With her waterline hull length of 23.98 meters and LOA of 29.2m she falls just within the category that allows her to be driven without a yacht master or professional certificate – a considerable attraction to prospective owner-operators. She does, however, have a raised and separate pilot house, so she is entirely suited to being in the charge of a professional captain. Due for delivery in summer 2014, the retail price of the Ferretti 960 is €7,310,000.